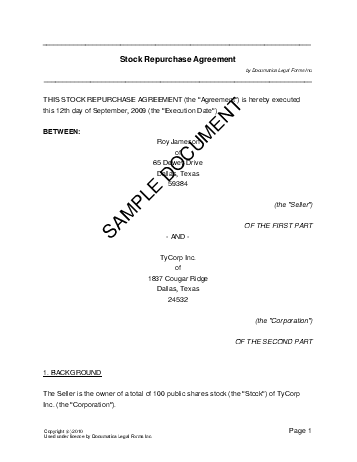 A Share Repurchase Agreement is used when a corporation is buying back shares from one of its shareholders. The agreement outlines the amount, schedule, and method of payment and any representations or warranties of the buyer and seller to each other. Is the corporation paying the whole amount at once? Do you wish for the warrants/representations of the Seller and Corporation to survive closing? A release clause states that the parties release each other from other obligations between them, and forgo present or future legal action. Do you wish for this agreement to contain a release clause? A confidentiality clause states that the parties will both keep the terms of this agreement confidential. Do you wish for this agreement to contain a confidentiality clause? We strongly recommend obtaining an attorney reviewed Share Repurchase Agreement directly from us. Below are some random samples we have created with Documatica. Please note that these documents reflect a certain set of answers, and it is very likely that the document you require is different. Do not rely on the templates below - create your own customized Share Repurchase Agreement with our webpage. For maximum legal protection, obtain a lawyer reviewed Share Repurchase Agreement directly from us.